My grand-daughter at the Chinese Cemetery with the Minox 35GT, one of the few that I got off the disastrous roll. I think perhaps the problem was an intermittently cold battery as the camera went in and out of my pocket, but have not had time to confirm yet. Nice! While I love the idea of the Minox 35’s and I love the little lenses in them, they are notoriously unreliable, especially the shutters and electronics in general. Hope your’s comes back to life with some exercise! Just a joy to shoot IMO. Best! Hi Mark, I think the problem, which I have not finished diagnosing due to lack of correct device, is that for some reason the battery drained quickly. It was going in and out of my pocket on a cold day, so if carrying it for a while it might have chilled the batteries too much, and otherwise warmed up enough for one frame. Anyway, I need to test a few things – the guts all look the way they should, and the mechanism fires properly. There is a standard fault that the shutters develop that is very easy to fix and is well described on the net, and it is not that fault as I had a look. For me these cameras are too fiddly to use without thinking – first you have to open the drawbridge, then the aperture ring is nearly impossible to reach, and estimate focal distance and set that. Put up agains an Olympus XA or XA2 and they both win hands down – as good or better optics, much better ergonomics, and so on. If it is working then it will be leaving my collection some time soon. love her pose and reflection…sweet photo. Hi Sherry – catching up on really old comments, sorry about the lag. At first I read your comment to say sweet potato. And she is a sweet potato. Sweet photo, in any case, and nice colors! 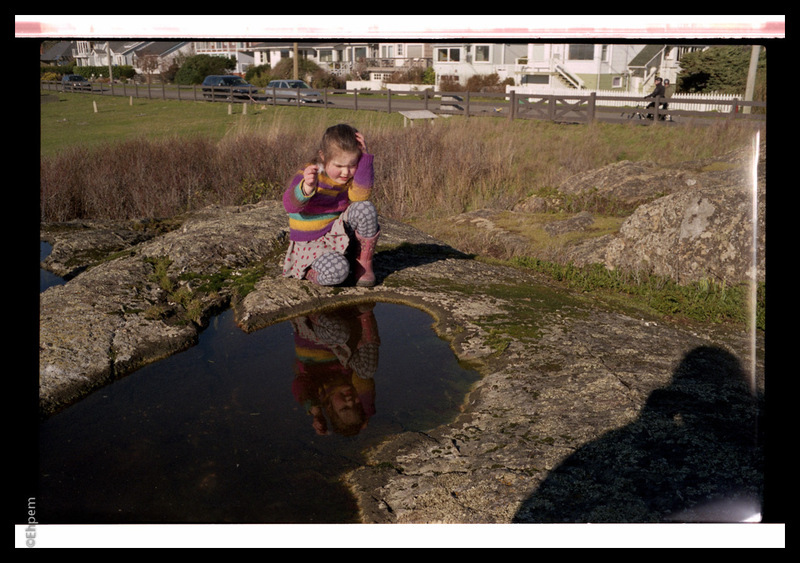 Thanks Lynn – the colours did come out well – Superia 200, of any age, is one of my favourites.